Looking for a great date night recipe this spring? 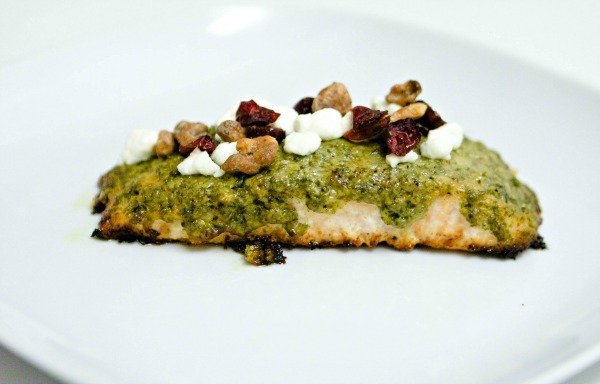 This Cranberry Walnut Pesto Salmon with Goat Cheese recipe is pretty enough for the job and is chock full of my favorite flavors. 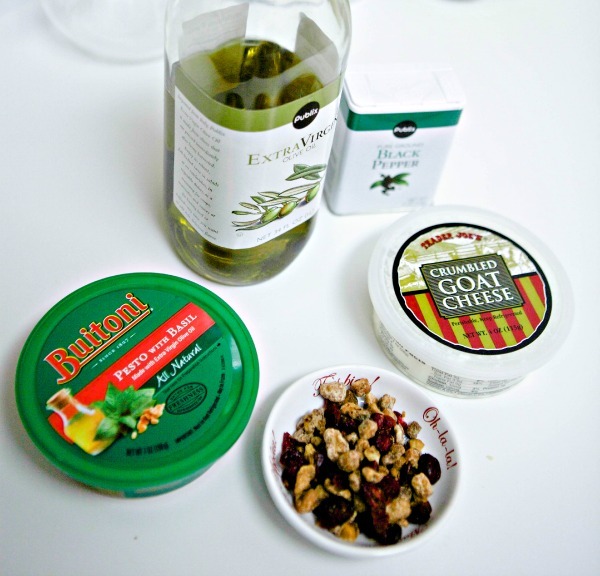 The richness of the pesto and warm goat cheese is set off deliciously by a bit of sweetness from the cranberries. The walnuts add just enough texture to the dish to make it extra satisfying. Don’t worry, although it sounds impressive, it couldn’t be simpler to make! Salmon can be expensive, but this super food is worth it! This fish has some amazing health benefits and if you’re looking for beautiful skin, nails, and hair look no further. It’s a high-quality protein, packed full of vitamins and minerals like potassium, selenium, and vitamin B12. Most awesome is their high content of omega-3 fatty acids which promotes healthy brain and heart function. Salmon is a super healthy choice during pregnancy as well, just be careful to limit your intake to under 12 oz a week due to the mercury content. I couldn’t think of a better dish that will make you feel great AND look great than this cranberry walnut salmon! Preheat oven to 365ᵒ. Rinse off salmon fillets in cool water and pat dry. In baking dish (skin side down if it still has it), coat the fillets in olive oil, and black pepper as desired. 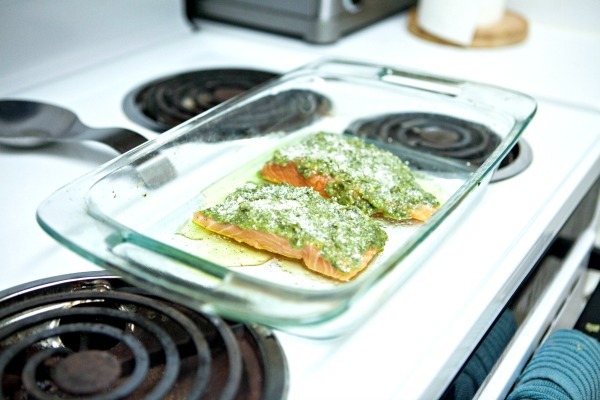 Layer the top of the salmon fillets generously with the pesto sauce and sprinkle with parmesean cheese. Cover dish with tin foil and bake for about 25 minutes, depending on how well you like your salmon cooked. Combine chopped walnuts and craisins together in light olive oil. Top cooked salmon with cranberry and walnut mixture and sprinkle on the goat cheese crumbles. Bake uncovered, for another 5-10 minutes. 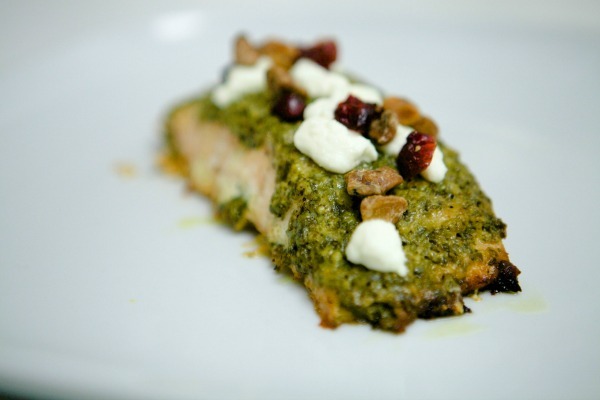 I hope you enjoy this pesto cranberry salmon recipe. 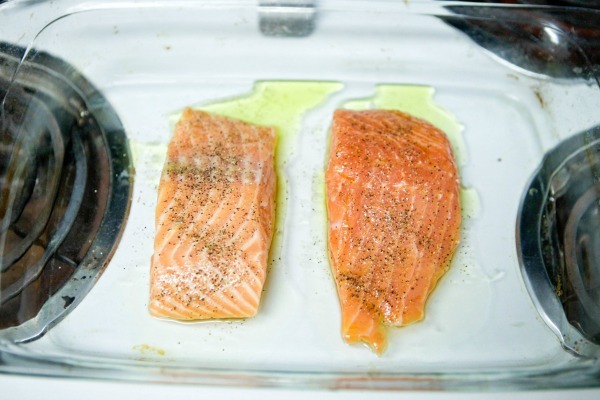 What is your favorite way to prepare salmon? Tell us about it! This looks wonderful and a different way to prepare salmon. Thanks for sharing it on The Yuck Stops Here! recipe link up.